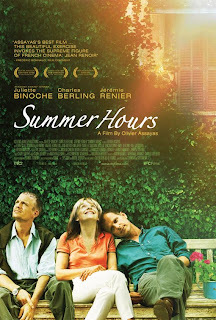 Olivier Assayas’ Summer Hours (L’heure d’été), which recently competed in the Vancouver French Film Festival, is an intelligent and touching study of family dynamics in the face of unexpected change. Just as Jonathan Demme’s great Rachel Getting Married explored the out-of-control drama, dynamics and chaos surrounding impending nuptials, Assayas’ film takes a long, hard glimpse at the complications of death and the effects in which treasured memories colour our long-term life decisions. The journey is captured in a no-frills fly-on-the-wall approach, an economical mode of storytelling which strips the work of artifice and allows us free roaming access into these fascinating people’s lives. 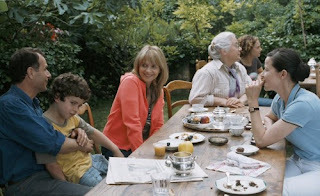 The film opens with the extended relations of lovably eccentric family matriarch Hélène (Edith Scob) gathered at their gorgeous sun-lit sum mer house in the lush French countryside in celebration of her 75th birthday. Her three children – Adrienne (the always sophisticated Juliette Binoche), a New York-based designer, Frédéric (Charles Berling), an economy professor and Jérémie (Jérémie Renier), a Puma Athletics executive operating out of China – have arrived with their assorted gaggle of significant others and offspring and, between joyful gift-giving and merriment, are playfully regaling each other with nostalgic childhood reminiscences of lazier carefree days. For Hélène though, this is a chance to lower her mask of fashionable radiance and confess a heavy secret to elder sibling Frédéric. However, after he proves reluctant to pay heed to her concerns regarding her own mortality, and the fate of the beloved vacation home, the families retreat back to their own comfortable separate realities. A short time later, Hélène’s grave concerns prove sadly accurate, and the family, grieving and fatigued, are forced back together, tasked with not only laying their mother to rest, but also deciding the fate of her lavish summer place. For, besides being a monument to their cherished past, it has also, over time, been converted by Hélène into a makeshift tribute to their late artist great uncle. As the trio of now-adult children weave their way through endlessly complicated decisions and questions, alternately supporting one-another and butting heads, they are faced with having to decide whose dreams are more important to hold onto; Hélène’s or their own. Director Assayas handles Summer Hours’ fragile material with an elegantly gentle hand, carefully coaxing profoundly moving moments from his classy team of top-quality actors. It’s somewhat amazing, after viewing an endless procession of dumbed-down mainstream North American cinema, to encounter a director so intensely focussed on relating adult themes without succumbin g to cheap sensationalism. When the three siblings engage in an important discussion over whether to sell the country house, Assayas refuses to simply lay out the scene’s messages and ambiguities, urging us instead to peer beneath the forced pleasantries and grasp the emotions behind the behaviour. Similarly, he ends the film with a scene which seems oddly random but, the more you think about and analyze it, is as poetic and impactful as any possible conclusion. There is so much beauty in the film that it occasionally even pulls our eyes away from the intriguing complexities of the characters. Despite the naturalistic quasi-do cumentary feel created by cinematographer Eric Gautier, there is an almost other-worldly beauty to the French countryside, with its ever-stretching yards of flourishing emerald green trees, crystalline blue sea and rustic stone walls. The house is a character unto itself, filled with gleaming wooden antique desks and cabinets, decorated with an evocative collection of ornately framed art-work. If ever there was a film to convince you to pull up stakes and head to France, this is it. Although Juliette Binoche gets first-billing (The benefit to winning an Oscar, folks! ), Charles Berling is the true conflicted heart of the film. The most grounded, emotionally and geographically, of Hélène’s brood, Frédéric nobly carries the majority of the burden, with the longest road to travel towards acceptance and catharsis. Like his beleaguere d character, Berling carries the film with quiet dignity, revealing the elder son’s soul in quieter solitary moments, as in a scene where, after clearing the table, he sits alone and contemplative in a darkened room. It’s a wondrously inspired performance. Edith Scob, as Hélène, is also invaluable, casting her vibrant presence over Summer Hours long after she has departed. Her final scene, solemnly climbing a shadowy path towards her sun-drenched abode, is unforgettably heart-rending. It would have been easy for lesser filmmakers to be overwhelmed by the inherent gloominess of the movie’s subject matter, but instead they have produ ced one of the most life-affirming cinematic experiences of the year. This is a mature examination of not only the wonders of mortality, but also the importance of memory in shaping who we are. By film’s conclusion, we realize, alongside the characters, that it’s not so much the place and belongings that matter, as much as what we have brought and taken away from them. Summer Hours is truly magnifique. *Originally printed in SFU's The Peak: July 27th, 2009.